PersonalizationMall.com was founded in 1998 with headquarters located in Burr Ridge, Illinois. Our goal is to serve our customers by making personalized gift buying quick and easy. Our revolutionary preview technology takes the guess work out of personalization, by allowing you to see what your gift will look like, personalized with your details, before you buy it! It shows you went out of your way to find a unique gift and to personalize it to make it theirs alone! The personalized gift is the one that gets passed around at the party, for everyone to see! It makes you feel good to give, and it's even more special to receive! Select a Personalized Gift You Won't Find Anywhere Else! At PersonalizationMall.com, our gifts are as unique as the person receiving it! The majority of the designs we offer were created by our team of talented artists, and available only on our website. We are committed to protecting your privacy. Our website is secured by Verisign, an industry leader in online security, so you can be confident that shopping at PersonalizationMall.com is safe. It is also our policy that we never release customer information to third parties. Make your gift unforgettable... make it from PersonalizationMall.com! Our exclusively designed Personalized Easter Bunny Basket is the perfect accessory for your little ones as they search for painted eggs and chocolate confections this Easter! 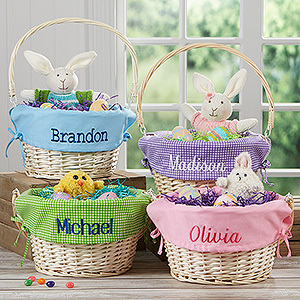 All kids will be thrilled Easter morning to see their name featured on their basket with our Personalized Willow Easter Basket with Drop-Down Handle! 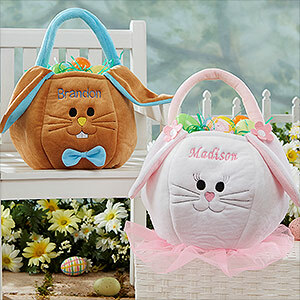 Each willow Easter basket is embroidered with any name, on the removable liner, in your choice of thread color and 9 font options. Choose from 9 liner colors, 4 solid and 5 checked options! 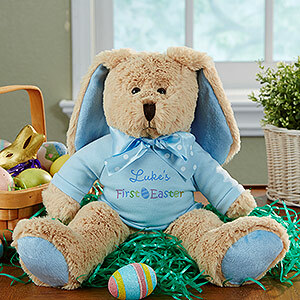 Our exclusive Ears To You Personalized Plush Bunny has a long-eared lovable bunny hiding out in the tall grass behind your child's first name! Design will be printed on a pink or blue t-shirt. Measuring over a foot tall from ears to toes, our plush Ears To You bunny is decked with a polka dot, satin bow and features unique pink or blue ears and feet! 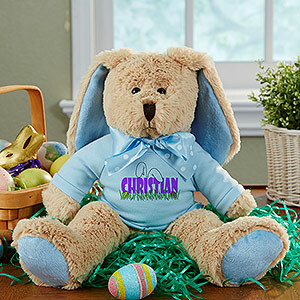 Available in boy or girl designs, each with your baby's first name personalized above our exclusive multi-colored "First Easter" design! 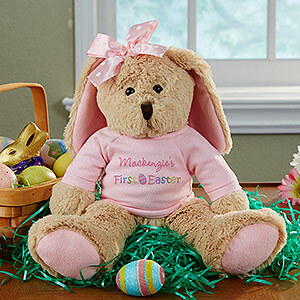 Measuring over a foot tall from ears to toes, our plush First Easter bunny is decked out with a polka dot, satin bow and a soft blue or pastel pink t-shirt! Personalizationmall has an amazing selection of items! Giving someone a gift that's personalized is the perfect way to make them feel extra special. Personalized gifts are also gifts that people love to hold onto year after year. With Personalizationmall you can select from their wide selection of items and have them personalized and shipped to your door in no time. I received the items above and have to say the quality is amazing. The embroidery is well done and the stuffed bunnies were the softest bunnies I've ever felt. My kids absolutely love having Easter baskets with their names on them. As an added bonus they can use them for all their Easter egg hunts and no longer have to worry about anyone having the same basket as them. The Easter baskets are absolutely adorable and I can't wait to fill them up come Easter morning! Personalizationmall is the perfect place to shop for all your gifting needs! Click HERE to purchase and view other items Personalizationmall sells! 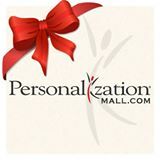 Click HERE to learn more about Personalizationmall! Follow Personalizationmall on social media!